Markets experienced mixed results following the EIA’s energy data yesterday, with crude and diesel prices rising moderately while gasoline soared. Crude gained 43 cents (0.7%) yesterday, but are down 40 cent this morning. Currently, crude is trading at $57.69. Diesel prices saw even smaller gains yesterday, picking up an indiscernible 0.16 cents (0.1%). Today, prices are sliding into negative territory, with prices down a tiny .09 cents, yielding a price of $1.9433. Unlike diesel, gasoline prices soared yesterday, picking up 3.6 cents (2.1%). Today, gas prices are following the rest of the oil complex lower, losing 0.4 cents to trade at $1.7316. The EIA released their weekly data yesterday, which helped support markets. The data showed an even stronger draw from crude inventories than expected, combined with a smaller than expected gasoline inventory draw. The one surprise was diesel inventories, which saw a small build instead of the expected draw. Today’s second article takes an in-depth look at inventory trends over the past few months. On the production side, refiners had another week with gasoline production above 10 MMbpd and diesel production over 5 MMbpd. The United Kingdom’s Forties Pipeline remains offline, and reports are now estimating the pipe will be repaired by early January. Repairs were initially expected to last just two weeks. Given the importance of the pipeline to Brent crude oil prices, it’s surprising that prices did not move higher following the revised estimate. 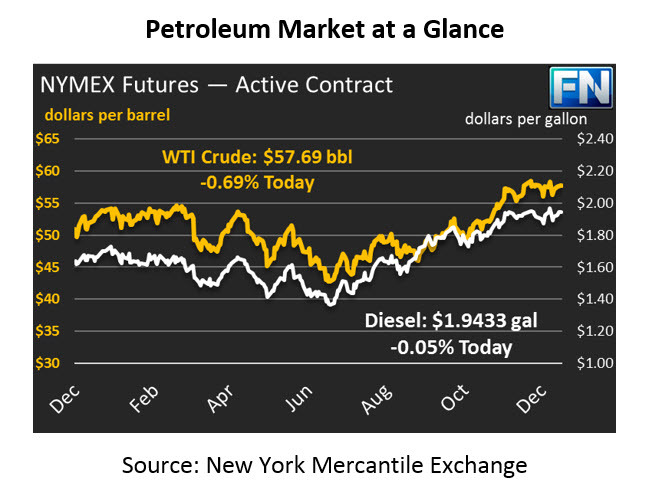 Perhaps the market is responding positively to certainty as to when the pipeline will be fixed.